Drivers side: Unclip the plastic cover to access the back of the headlight assembly. Passenger side: Remove the three screws securing the duct behind the headlight assembly. Reach behind the headlight assembly. Pull aside the rubber boot and unclip the retaining wire. Remove and replace the bulb. Anchor it with the retaining wire and seal it in with the rubber boot. Use a screwdriver to pry the metal hood release handle out. Pull the grille straight up and off. Remove the four T30 screws exposed. Remove the two T30 bolts on the panel below and to the side of the headlight assembly. Remove the four screws securing the headlight assembly. Use an extension to access them all. Pull the headlight assembly out. Remove the wire ties from the new headlight assembly. Bolt the assembly back in. Secure the panel below the head light assembly and reassemble the duct if you had to remove it. Reconnect the fog lights and thread through the marker light harnesses. Bolt the bumper cover back on. Clip the grille back on and screw in the screws. Easy to order, shipped timely, fairly easy install with video. Hardest part was dealiing with fastener holding grill. Backing came loose had to cut old headlight to get pliers on it to hold from spinning. New headlights fit well look like new! The headlights were great and the service is always good and prompt. My old headlights had become quite yellowed and dim (2003 Passat). Ordered these and had my mechanic install them. Its wonderful to be able to see the road again! They arrived quickly and were exactly what we needed. the lights look nice once installed but I had to have a second set sent to me because the first ones came off the track when trying to adjust them. This was very easy to do, there is no resistance or stop point, once you have gone too far that is it, they are broken. this happened because of the projector style fixture they are, this is a European design and is not good, I never could get them to adjust high enough to shine down the road decent, the cutoff is terrible. Nothing else to say. Buy them if you need them. You wont regret it. Great quality. I was expecting top notch quality and I was not disappointed. The fit is perfect and the headlights look great. Purchased these back in August of 2017 to replace the factory headlights that were dull and the adjusters were broke. They came earlier then anticipated and looked great and even came with bulbs. We installed them about 2 weeks later. Easy install after removing the grille and front bumper cover but could never get them to adjust. We decided to hold off as we did not want to break the adjusters after researching it. Recently we had the car in to a VW / Audi repair shop for other work and asked them to adjust them. Same problem, they told us the adjusters were not moving at all and didnt want to risk breaking them. Recommended using only genuine VW parts and not aftermarket parts from China. may try to remove and work on them in the spring time. Beware, you get what you pay for! Needed to replace two headlights on 2001 Passat. Received quickly and in beautiful shape. My friend and I are not auto mechanics or auto body pros. The removal an installation went like a dream. The sellers video was a great help and made what I thought was to be a nightmare into a dream install come true. This will.be my go to supplier for all my car needs. Thanks so very much!! Excellent headlights for the price. Produce a lot more light then the old stock ones. Definitely worth purchasing. Great headlights for a great price! Every other store sold only one light for $120. My mechanic had no trouble switching them with the old ones and they make the car look very clean and new! The OEMs on my 2004 Passat 1.8T are so yellow that the visibility without the fog lights is a nightmare. I had thought about just doing a restore, but honestly I felt it would be better to just buy these from 1A Auto. I know the part is an exact fit and is quality. While the install is involved (German over engineering), the video (Wagon version) 1A Auto made is very helpful. Mike does a great job explaining how to do it. Also make sure you aim the new headlights one you get everything back together. Highly recommend these, and I highly recommend 1A Auto! Thanks guys and gals for all the hard work you do!!! You make working on vehicles much easier!!! My one wish is to go back to glass headlights days. They never yellowed, and were just better. I ordered a set of replacement headlights for my 2002 Passat. Was very pleased with the quick delivery of the items and the relative ease of installation. 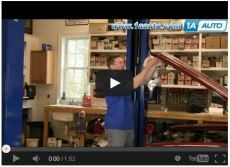 I referred to the instructional video on YouTube provided by 1aauto which gives a step by step process to follow. You can not go wrong with 1aauto. Very seldom do I write a review but this is an exception. The headlights were received on time and wrapped very carefully. I had watched the instruction video several times and was prepared with the designated wrenches. The installation went just as shown in the video. I did it alone except I let my wife hold up one end of the bumper while I fastened the other end; my arms werent long enough. Someone had commented that the adjustment was not good. This was not my experience; it worked just as advertised. I would not have been able to get this job done without the excellent video. My recommendation is to make the purchase and get the job done. I wish I had done it 5 years ago. It has made a dramatic improvement in the appearance of my car. The total working time for the job was 3 hours. I am a little old and had to rest several times. By the way, the bulbs were furnished it the lamps I received. I thought I was going to have to purchase the bulbs separately. Good purchase! I would recommend this product to anyone looking to buy these lights. XLNT Price. Correct fit... Challenging install... Great Results. I love the parts I get here. Only one part was the wrong item. Prompt and courteous refund. No questions asked. Do the headlight housings for a 2002 Volkswagen Passat have a permanent seal? I bought them for a 2004, and they are sealed like the OEM version. Do you need to align the headlight assemblies after install or are they factory pre-set? I had to adjust them. The drivers side needed very little adjustment however the passenger side took some time. I imagine youll have to take some time adjusting them. The good news is the adjustment screws are very easy to access. Yes, you need to align them. For the units I got, I never successfully got them aligned properly. The alignment wormgears are made of plastic and its easy to strip the gears, so be careful. There are guideson the internet specific to the Passat B5 headlights that May help. Yes, you do need to align the headlights. The alignment screws on my assemblies stripped very easy too. Align is required. For the money this was a good deal. Shop wanted to charge me $400 just to replace the drivers side. I had to take it to the dealer for alignment at no cost. Yes, you will need to adjust these or aim them. You need to align them. Is there a way to adjust the headlights after I overturned one of the alignment screws? Now I can barely see at night and dont want to buy another headlight. Usually, you can turn the screw in the opposite direction and it would start to thread back on. It would probably be helpful to put some pressure on the adjustable part of the headlight. If you can not get it to thread back on you may have to replace it. Thanks!